The SMART RRS Project Final Event took place from Monday 23rd to Wednesday 25th of April, 2012 at the European Parliament in Brussels, hosted by MEPs Wortmann-Kool (The Netherlands) and Ayala-Sender (Spain). Co-funded by the European Commission, the SMART RRS project has developed an innovative road restraint system taking the safety of vulnerable road users into account. The new intelligent barrier brings several substantial improvements to today’s EU standardized roadside barriers by proposing solutions addressing motorcyclists’ safety issues such as shock absorption, traffic information, and emergency response, three of Europe’s key road safety priorities 2011-2020. At the occasion of the SMART RRS Final Event, MEPs Wortmann-Kool and Ayala-Sender addressed the problem of roadside barriers and motorcycle safety. The exhibition was opened from April 23rd through April 25th. Project Full Title: Innovative Concepts for smart road restraint systems to provide greater safety for vulnerable road users. 1.2 million people worldwide are killed in road crashes each year with up to 43,000 dying in Europe. Up to 50 million are injured with at least 600,000 hospital admissions on a European level directly attributed to road traffic accidents. This costs European society approximately 160 billion euro and uses up 10% of all health care resources.This would mean that by 2020 road traffic injuries will be the third leading contributor to the global burden of disease and injury. Many injuries and deaths are a result of impacts with current road restraint systems especially in the case of vulnerable road users such as motorcyclists, cyclists and passengers where impacts with supports or edges usually result in amputations or sectioning of torsos in a guillotine effect. Furthermore once an accident has occurred; the time between the impact and receiving immediate inicial first aid can be crucial; delays in alerting emergency services or incorrect location information given to emergency can cause waste life saving moments for injured people or even result in emergency services going to the wrong location of the accident. This project will develop a new smart road restraint system that will reduce the number of deaths and injuries caused in road traffic accidents by integrating primary and tertiary sensor systems in a new RRS system; providing greater protection to all road users, alerting motorists and emergency services of danger so as to prevent accidents happening, and alerting them of accidents as they happen to maximise response time to the exact location of the incident. This week a dummy in motorcycling gear sliding into a guardrail was exposed in the European Parliament in Brussels, flanked by a Triumph Tiger 800 and a Yamaha Xenter 125. 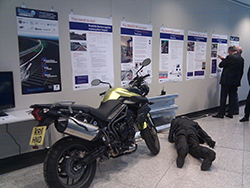 The exposition presented the Smart RRS project, which developed a road restraint system effectively protecting motorcyclists from impacting against posts, and featuring sensors to warn road users from hazards and call the emergency services after an accident. 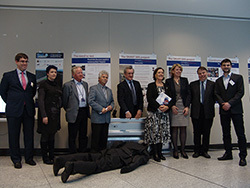 The final event of Smart Road Restraint Systems, a project co-funded by the European Commission was hosted by the two members or the European Parliament Corien Wortmann-Kool (The Netherlands – EPP) and Inés Ayala Sender (Spain – S&D) and organised by the Federation of European Motorcyclists’ Associations. 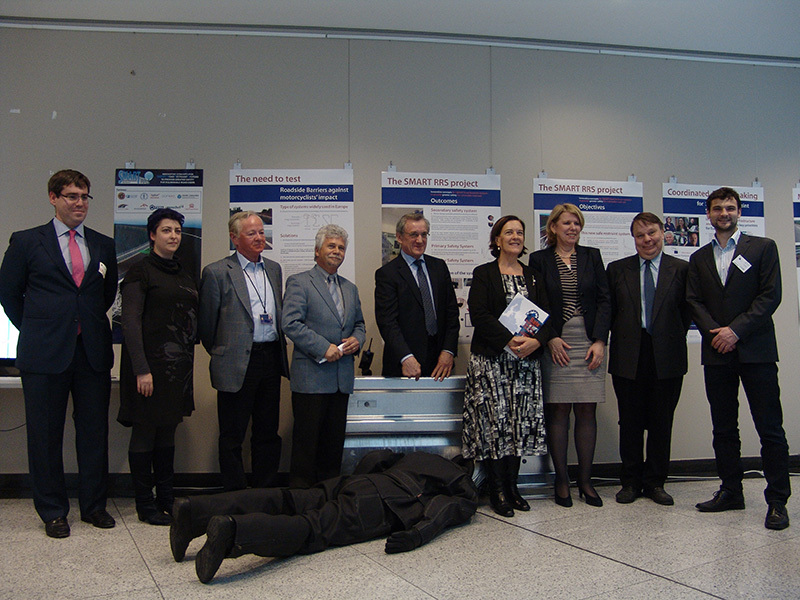 On Tuesday, April 24th a reception officially opened the exposition and attracted Members of the European parliament from many different countries and political groups, as well as representatives of the Council and of the European Commission. The following day a lunch debate on the topic was held. On behalf of Smart RRS project partners, IDIADA and Arcelor Mittal, Eduardo del Pozo de Dios and Radim Pachlopník presented the outcome of the project: a guardrail with a second lower rail and a new shock-absorbing mechanism protecting the riders of motorcycles or scooters sliding on the road after an accident. Different sensors are installed on the guardrail, able to detect accidents following an impact and call emergency services accordingly. The sensors can also be connected to variable message signs to warn road users about the risk of aquaplaning, or about the presence of ice, scree material or any objects blocking the road. Tapani Mikkeli, Deputy Head of Unit of the European Commission contributed as the third speaker and addressed the issue of standardisation. Until today EU Standard road barriers only need to comply with crash tests involving trucks and cars. Mr. Mikkeli expressed his confidence that EU member states would finally agree on a common testing standard for motorcycle friendly road barriers by 2013. This was the project Elaine at Right To Ride brought in to FEMA when she was their research officer. It’s nice to see that all her efforts were worth it and perhaps something good might come out of it.